If one considers the designer toy art movement to essentially be a form of sculptural pop surrealism, then works within it must meld pop art’s reverence of the mundane with surrealism’s exploration of the imaginative. Frequently employing the movement’s own factory-produced forms, these themselves merging a toy-like aesthetic with a fanciful profile, designer toy artist’s express themselves by the decoration applied to these sculptures. But Task One’s Lite-Brite MAD*L series of works from 2010 are of a slightly different bend, one that requires the MAD*L form itself to imbue the pieces with the requisite surrealism. So what is the MAD*L? The MAD*L form was conceived by MAD (Jeremy Madl) in 2002, only two years after he received his BFA degree, but it wasn’t until 2004 that they were first issued. With the roughly 5-inch tall vinyl pieces debuting with a series of three designs, the MAD*L – Phase 1 collection, producer Wheaty Wheat Studios quickly followed these with the MAD*L – Phase 2 trio (2005) and the MAD*L – Artist Series (2005) as well as several standalone, exclusive editions for various outlets. Beginning in 2007, Madl assumed production responsibilities for subsequent MAD*L versions through his own Solid Industries, Inc, which included introducing a larger version of the form. Though an extremely limited number of 20-inch tall MAD*L pieces were used as canvases by over fifty artists for the MAD*L 2k5 Show (2005) at the Oulous Repair Shop Gallery in Los Angeles’ Chinatown, this larger rendition of the form was never available readily to collectors. In fact, it wouldn’t be until 2008 that any size but the 5-inch ones would become easily accessible, when a 10-inch tall MAD*L version would debut as part of Madl’s Some Stuff I Made exhibition at myplasticheart in New York City. With these double-sized MAD*L versions strictly being offered undecorated by factory paints, lending them to be either utilized as canvases by artists or simply enjoyed as stylized sculptures by collectors. And it is perhaps because he found a way to accentuate this latter option while still expressing himself creatively that made Task One‘s renditions on the form so memorable. And who is Task One? Growing up in Iselin, New Jersey, an east coast community about thirty minutes outside of Manhattan, a young Task One spent his nights tagging the streets, building his graffiti alias. Eventually spending three years at art college and having a brief stint in corporate New York, Task One relocated to San Francisco in 2001, bringing his tag along with him. Continuing to ply his spray-painted trade over the next decade, his desire to experiment artistically manifested in the 3D Street Sculpture Project, wherein Task One hand-painted cast interpretations of his tag and affixed them to buildings. One of the first people Task One befriended in San Francisco was artist Mars-1 (Mario Martinez), who was in the process of designing his own vinyl sculptures with local company STRANGEco. Introduced to the designer toy art movement through this association, Task One’s career creating them only truly started in 2007. Finding the concept of simply applying paint to someone else’s pre-made sculptural form unappealing to him artistically, Task One would frequently cover the vinyl forms completely with his own sculpting or deconstruct the shapes to re-engineer them into something wholly new. And these completely unique works by Task One materialized in a plethora of ways, including the likeness of fictional and/or famous personages, fantastical recreations of architectural structures, and reconstructed renditions that often employed internal LED lighting, such as that seen in his Lite-Brite MAD*L series. Named as one of the “All-TIME 100 Greatest Toys” by Time Magazine, Hasbro‘s Lite-Brite was originally marketed in 1967 and allowed kids to create a glowing picture by placing multi-colored translucent plastic pegs on a lightbox base. 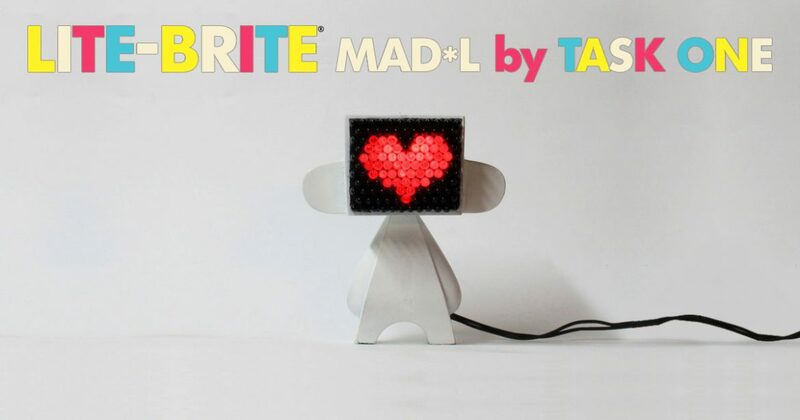 And for his series of two 10-inch tall renditions and three 5-inch tall ones, all made available at 2010’s San Diego Comic-Con through Dragatomi, Task One transformed the MAD*L‘s oversized box head into the working likeness of a Lite-Brite. Featuring a replaceable 7-watt bulb in each one’s head, there was an on/off switch on their electrical cords and holes in their backsides that allowed for storing the usable plastic pegs inside the body. And while these weren’t the first instance of traditional toys and games being interpreted on designer toy forms, such as the works Sket One (Andrew Yasgar) created for his Snake Eyes exhibition at Toronto’s CiRCA in 2008, these Lite-Brite MAD*L pieces reveled in being pop art creations, imbued strictly with the nostalgia of a toy many grew up at least knowing of. But, as a consequence of this choice, Task One allowed Madl‘s sculptural form shine, letting the creative contours and stylized profile be the aspects that differentiate these from the truly mundane. But Task One wasn’t done with the concept, revisiting it later that year with the Mattia’s Universe piece, a 10-inch tall rendition that was donated to Mattia Fagnoni Onlus, a non-profit Italian association concerned with helping children suffering from fatal genetic diseases. For this unique work, Task One hand-painted a semi-realistic galactic snapshot across the MAD*L form contrasted beautifully by the Earth’s likeness created out of the Lite-Brite pegs.